It’s almost Thanksgiving and I’m sure plenty of you are starting to plan your menu, get your grocery lists ready and the panic may begin to be setting in….am I right? Well, I would love to share with you my Thanksgiving work horse today. It will help save you time, add amazing flavor to your dishes and help keep your turkey breast meat nice and juicy. It also couldn’t be easier to make! I’m talking about compound butter. I know that might sound like some fancy term but it’s basically butter (or vegan margarine) that has aromatics in it such as garlic, shallot, fresh herbs citrus zest. But really, it can have anything you want! You could do toasted sesame seeds, garlic and ginger for an asian twist or a some reduced red wine and minced shallots for a delicious topper for steaks. But today, with Thanksgiving nipping at our heels, I am going to focus on a very traditional Thanksgiving flavored compound butter. (1) Make this butter this weekend. Get it out of the way and be done with it! (2) Make extra and divide it into two batches. Freeze one batch for later and keep one batch in the fridge for you to use to flavor your bird next week. (3) You’re going to want this butter for stuffing, for the turkey and maybe even just to jazz up those buttered carrots or green beans. 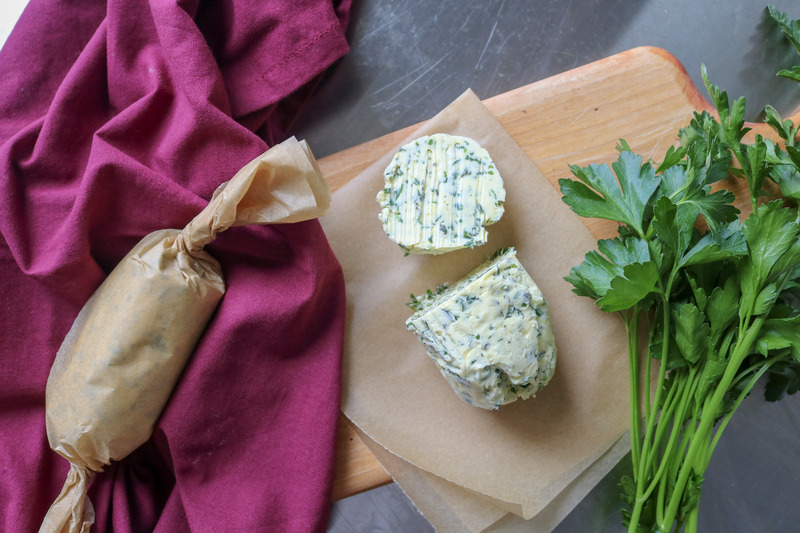 So be sure to use loads of herbs and garlic to make sure the flavor really shines through! Then wrap the extra herbs in damp paper towels, they’ll keep until Turkey Day so you can cross herbs off that shopping list! I hope you and your loved ones have a delicious, beautiful and most of all happy Thanksgiving this year! (1) Grate the garlic on a microplane or mince finely. Add to a bowl with the softened butter. (2) Mince the rosemary, thyme and parsley by hand (along with any other optional ingredients you may be adding). Add to the bowl with butter along with the salt. (3) Use the back of a fork to mash the butter with the aromatics until fully blended. (4) Divide between two pieces of parchment paper and roll up like a tootsie-roll. Place in the refrigerator or freezer until ready to use. (1) add the garlic, rosemary, thyme and parsley to the bowl of a small food processor. Pulse until finely chopped. 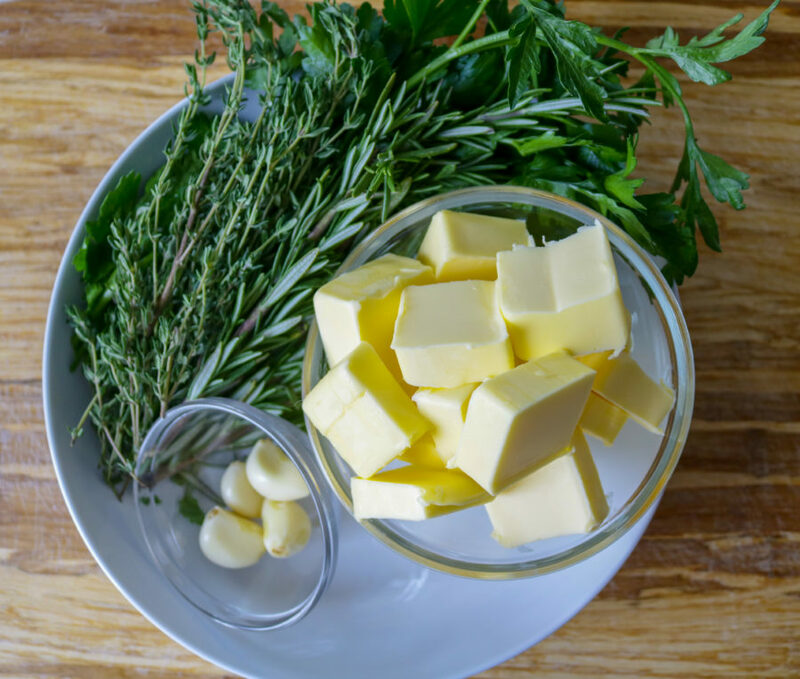 (2) Add the softened butter to the food processor bowl along with the salt and pulse just until the herbs are blended with the butter. (3) Divide between two pieces of parchment paper and roll up like a tootsie-roll. Place in the refrigerator or freezer until ready to use.